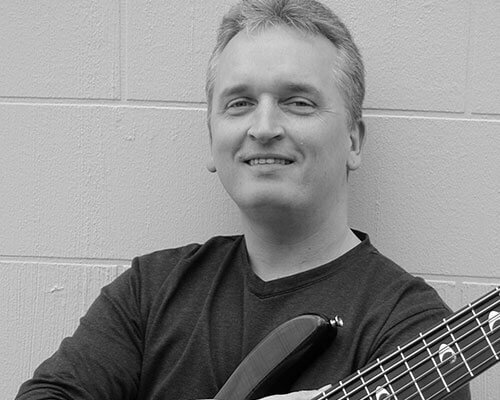 Jim Kalson has been a professional bass player since the age of 13. Early in his career, he was a member of The Kalson Family band that toured the country. They were managed and booked by the Lavender Blake Agency and shared the stage with artists such as George Jones, Tammy Wynette, The Statler Brothers and Ronnie Milsap, to name a few. Jim started his solo career at 18, and has been playing jazz and contemporary pop music since. He has performed extensively with jazz artists Paul English, Joe LoCascio and David Caceres, and has been featured with renowned jazz professionals including Gordon Goodwin, Bob Mintzer, Jon Faddis, Ndugu Chancler, Paquito D’Rivera, Kirk Covington, Will Kennedy and Kirk Whalum. Jim is no stranger to the music studio either with many hours spent in local studios including BGM Studio, Bobby’s Audio Machine, (B.A.M.) Salmon Peak, Windmill Valley, Bismeaux, Keith Harter Music and Chaton Studios in Scottsdale, Arizona. His dozens of album credits include performances with Willie Nelson, Little Joe y La Familia, Rick Cavender, Jazz PR, Terri Hendrix, Ron Wilkins and Footprints. Other studio credits include television and radio commercials, jingles and demos for companies including Ancira, Taco Cabana, Bud Light, Red Lobster, Coca Cola, Western Sizzlin, HEB, SBC Call Notes and Hair Club For Men. Jim has spent his time in the orchestra pit, as well, with touring Broadway musicals such as Grease, Menopause The Musical and A Chorus Line. He has had numerous San Antonio Symphony Pops performances with artists such as The Golden Boys, Broadway Rocks, Martin Short, Joel Grey, Vicki Carr, Patsy Torres and High Class Brass. He performed in 2007 at La Villita Assembly Hall in San Antonio, Texas with legendary drummer Buddy Miles. Jim is currently touring with Donald Braswell of “America’s Got Talent” fame. Jim served as an Electric Bass Instructor at U.T.S.A for twelve years and has been an instructor with Saint Mary’s University since 2002, and Alamo Community Colleges since 2010.